The little gem pictured here is the Guia “T,” and if you aren’t agoraphobic, it is the key to living in Buenos Aires. (Agoraphobes, you need a comprehensive pile of grocery, restaurant and gelato delivery menus–yes, you can get almost anything delivered here). 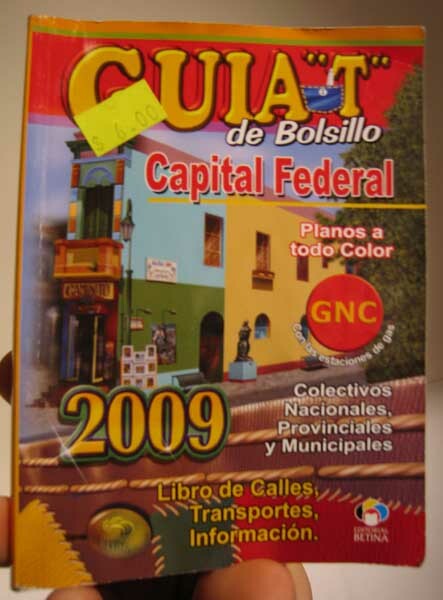 The Guia “T” is a hand-held miracle guide to the millions of different bus lines and their routes, the subway, and all of the streets in this thriving metropolis. We have already begun to to think of the geography of Baires in terms of the Guia “T.” In other words, we live on Page 9. (As in, “you live on page 9–nice neighborhood.”) We are looking at schools for the girls on Page 7 to begin with, Page 8 if we have to. Also, we can time how long it will take us to walk places because each page of the Guia “T” has a grid superimposed over it, and it takes about 10 to 15 minutes to walk across a grid rectangle. This entry was posted on Wednesday, October 15th, 2008 at 8:51 pm. You can follow any responses to this entry through the RSS 2.0 feed. You can leave a response, or trackback from your own site.